Feel free to tweak them, test them and … do let me know how things panned out for you and your students. Enjoy & share! A middle-aged grey-haired man is walking out of a house. He is wearing worn-out jeans and a T-shirt. In his hand he is carrying a blue plastic bag, probably a binliner. The bag looks full, but not too heavy. He is walking towards the gate. The man is frowning and looking sideways, as if he was hiding something. There is an air of mystery around him. What’s his secret? Three people from neighbouring homes have noticed him and are giving him suspicious looks. They don’t seem to trust him at all. A problem solving task – a fluency-based speaking practice activity. After their share their strings of associations, have them explain what viral marketing is all about. In new pairs, students come up with a list of features that make a successful viral video. Then share and discuss their ideas with each other. After students present their ideas, show them the video, which was the last project completed by late Alan Rickman before he died in January 2016. Display the wordlcloud. Get students into pairs. Have them work out what 2 tricks Facebook`s founder uses to make his meetings more efficient. Students have to use up as many of the words on display as possible. Select the countries on the map that your students are familiar with. Get students into groups. Assign one country to each group (keep the country names secret from other groups). brainstorm stereotypes of the country assigned to them. give the country a name based on one of the stereotypes in the list (Ideas used by Martin include: India “Holy Cow”, New Zealand “Middle Earth”, Canada “Maple Syrup”, and Japan as “Anime”. Show the “Map of Stereotypes” to them and tell the brief story behind the map to students. Then have them compare their post-brainstorming lists of stereotypes and the country`s new name with the ideas Martin included in the map. 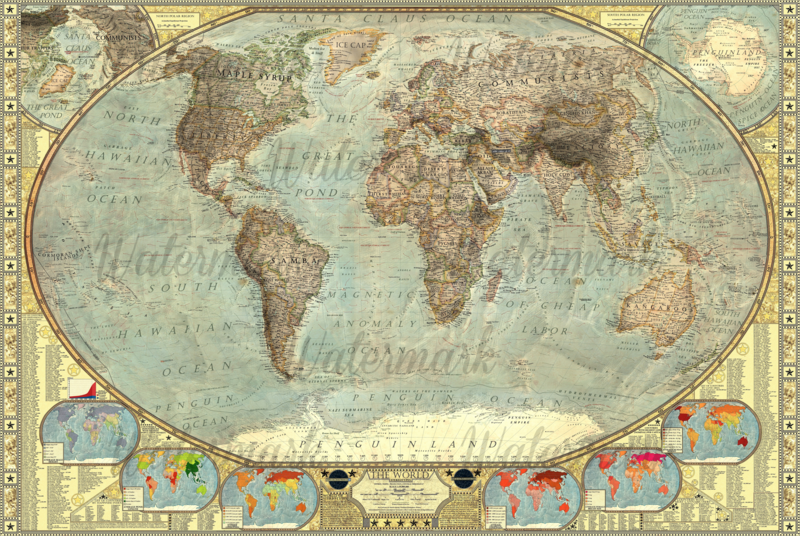 You can buy the entire world “Map of Stereotypes” by MartinVargic here. Students present their country to the group without revealing its real name. Instead they just mention the new name and 3-5 stereotypes. The rest of students try to guess the country. A video prompt for a fluency-based discussion. In groups, students travel in time into the future to the year 2050 and take a few minutes to decide on their vision of the hotel experience of the future. Have students watch excerpts of the video. This article gives extra details about the Henn-na hotel. Share extra facts with them, if you like. How do you feel about what you have just seen? How does it enhance the hotel experience that you are familiar with? What threats/drawbacks can you think of? To conclude, have a secret vote to find out how many studenst would like to stay in the robot-run hotels on a regular basis in the future. A lesson warmer or a conversation starter. Write these on the board: car, weather, morning, bad luck. Don`t give them any hints about the season. When ready, students swap groups to share their stories. Then they watch the video to compare their versions with the original. If you pause at the 0:36 mark, you can ask them to guess what kind of product can be advertised in this way (answer: coffee served at the STATOIL petrol stations). A lead-in activity in a grammar-based lesson. Show students the photo of Graham Pawley and the title of the BBC article: The man who can only say yes and no. In pairs, students discuss how in their opinion this predicament affects Graham`s life. It may come in handy if you list different aspects of life on the board: work, relationships, shopping, travel, etc. Briefly outline Graham`s story (or have students read the text and find out). This YouTube video showing him playing the harmonica adds the personal touch to the story and makes the character even more real. Use their sentences as samples to present the key grammar point: unreal present – conditionals type II. A lesson wind-down (the first lesson of the course/term) or a personalised writing activity to finish off the lesson on a positive note. Give out blank slips of paper and empty envelopes. Have students read the text and explain the difference between intentions and goals to you. Ask them to think of 1-2 intentions related to learning English. Give them time to put their ideas into words. Make sure they include first their intentions, then goals. Help them edit their work. They seal their envelopes with the intention-goal notes inside. Then they stick the envelope to the inside back cover of the notebook/course book. Remind students to open the envelopes and have them revise their plans in the final lesson of the course/term. A fluency-focused activity or a conversation starter. Write the first four lines of a dialogue between two shy people in love – inspired by the gif story. Dictate the dialogue or display it on the board. Don`t tell students it is a conversation between two CCTV cameras. Make them believe it is between two humans falling in love. Have them create profiles of the two characters. Ask them to finish the conversation, using the target language – in writing or as a role play. Topics: daily chores, stereotypes, random acts of kindness, jobs. A lead-in to a story writing activity or a conversation starter. Topics: technology, the Internet, mobile devices, addictions. In pairs, students take 5 minutes to write a 100-word paragraph of a story, starting with the sentence above. Language points: modal verbs for speculation, AS IF/AS THOUGH, WISH/IF ONLY, conditional clauses type 3. Show the embarrassing scene first and have students work out how come. Topics: judging by appearances, jumping to conclusions, prejudice. An article on cultural differences between the East and the West when it comes to tackling challenges and struggling. Topics: Cultural clashes, education and ubringing, values, success and failure. Students read the story of a lesson observation in a Japanese school [1st part of the text] and compare their opinions. In two groups [the East, the West] they read the text, looking for arguments to support ‘their’ culture`s approach to struggling. In pairs [the East + the West], students try to convince each other that ‘their’ culture`s approach to tackling challenges is more beneficial. Tell students the video holds the secret to what the topic of today`s lesson is. Students watch the video up to the 1:36 mark. Pause the video a couple of times and let them guess what questions the orangutan is going to ask the girl and vice versa. Keep encouraging tudents to guess the topic of the lesson [eg. technlogy, communication, animal rights, family relationships, travel, viral marketing, food, etc.]. Let them make the final guess about the lesson`s topic after you pause the video at the 1:36 mark. Show the rest of the video to reveal the campaign`s theme: environmental protection, in general, and saving rainforests, in particular. Start the lesson following the class where you introduced and practised the vocabulary related to the themes mentioned above with the video. Students watch the video and take notes of any theme-related expressions/chunks from the previous lesson that spring to mind. then, in pairs, students discuss the issues raised in the video, using the lexis from the previous lesson which needs recycling (their notes). January 10, 2016 January 7, 2018 Milada Krajewska"featured"